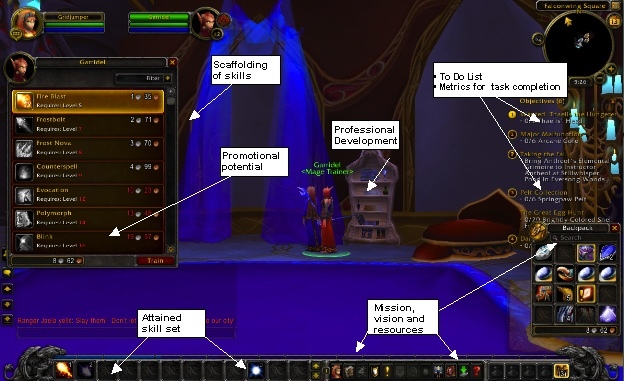 Proponents of using MMORPGs for education and professional development contend that gamification provides learning opportunities that are difficult or impossible to replicate in a FtF classroom setting. Indeed, the complexity in these games offers potential for transformational change. Participants must communicate, collaborate and problem solve to succeed, they must think. Team work is a common element in the games, and those teams with adept leadership and players who understand their roles are more successful in reaching team goals. Individually, participants have clearly defined objectives and metrics to define levels of achievement. A typical MMORPG User Interface may illustrate the metaphor better than my words can explain. That we can align MMORPG activity to the workplace and/or professional development symbolically may be a relatively simple task, to demonstrate the effectiveness of changing behavior among participants requires evidence and measurement. The body of evidence is growing. Jane McGonigal has presented her ideas and research on this type of transformational change. Dr. Chris Dede has also researched and presented on the topic, as have others in the military, the medical field and education. Perhaps using gaming technology and theory combined with instructional design and pedagogy would yield the benefits we continue to strive for in education, professional development and leadership development.